Hope: a feeling or expectation for something wonderful to happen. Kind of like a child (or an adult!) on Christmas morning... Can it get any better than that? Hope feels good; it is full of love and curiosity. It is full of genuine excitement. What if you KNEW something wonderful was going to happen today? Because something wonderful happens every day. Could it be the next email? The next phone call? Maybe it will be something your spouse or child says to you. Your hope achieves the impossible. Let your hope be strong and ready to bring in a miracle! This video is so cute! I have watched it several times and it STILL makes me smile. May we ALL feel this good and confident! Enjoy! Ready to feel this confident? Learning from a child...yet again. Topic: How does the Universe send you signs and messages? On the show from May 10, Marya and author Robin Leigh Vella chatted about ways the universe can (and does) speak to us, send us messages, guide us on our journey to more spiritual and peaceful living. You might be surprised how simple it is! On this show, we will continue our discussion. Do the challenge to prepare yourself! Challenge: Set a sign for yourself! See how the Universe responds! YogaAlliance.org: Yoga organization for finding your yoga teacher! Next Show (6/7/10): We will be taking a break on Memorial Day to relax and renew! We will be back on June 7 for an entire month of Yoga topics! What residual will you leave today? We are often very aware (sometimes painfully so) about how others affect us. How we feel after spending time with someone. Have you ever considered how you leave others feeling? We all leave a residue behind us wherever we go. Being aware of the residue we leave is a powerful practice. Today, leave a residual of kindness, love, compassion, understanding, and, of course, inspiration. Today, leave all you meet more joyful than when you greeted them. This week's fgm is a story to read. This story is so powerful! Read it and truly appreciate the power of your residual! Enjoy! Here is a fabulous story I received from one of my students. Every time I read it, tears run down my face. The power of letting someone know you care is strong indeed! A teacher in New York decided to honor each of her seniors by telling them the difference each of them had made. She called each student to the front of the class one at a time. First, she told each of them how they had made a difference to her and to the class. Then she presented each of them with a blue ribbon, imprinted with gold letters, which read, "Who I Am Makes a Difference." Afterwards, the teacher decided to do a class project, to see what kind of impact recognition would have on a Community. She gave each student three more blue ribbons, and instructed them to go out and spread this acknowledgment ceremony. Then they were to follow up on the results, see who honored whom, and report to the class in about a week. One of the boys in the class went to a junior executive in a nearby company, and honored him for helping him with his career planning. He gave him a blue ribbon, and put it on his shirt. Then he gave him two extra ribbons and said, "We're doing a class project on recognition, and we'd like for you to go out, find some one to honor, and give them a blue ribbon." Later that day, the junior executive went in to see his boss, who had a reputation of being kind of a grouchy fellow. He told him that he deeply admired him for being a creative genius. The boss seemed very surprised. The junior executive asked him if he would accept the gift of the blue ribbon, and give him permission to put it on him. His boss said, "Well, sure." 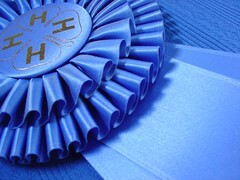 The junior executive took one of the blue ribbons and placed it right on his boss's jacket, above his heart. And then he asked, offering him the last ribbon, "Would you take this extra ribbon, and pass it on by honoring somebody else? The teenager who gave me these is doing a school project, and we want to keep this ribbon ceremony going and see how it affects people." That night, the boss came home and sat down with his 14-year-old son. He said, "The most incredible thing happened to me today. I was in my office, and one of my employees came in and told me he admired me, and gave me a blue ribbon for being a creative genius. Imagine! He thinks I am a creative genius! Then he put a blue ribbon on me that says, 'Who I Am Makes a Difference.' "
He gave me an extra ribbon and asked me to find somebody else to honor. As I was driving home tonight, I started thinking about who I would honor with this ribbon, and I thought about you. I want to honor you. My days are hectic and when I come home, I don't pay a lot of attention to you. I yell at you for not getting good enough grades and for your messy bedroom. Somehow, tonight, I just wanted to sit here and, well, just let you know that you do make a difference to me. Besides your mother, you are the most important person in my life. You're a great kid, and I love you!" The startled boy began to sob and sob, and he couldn't stop crying. His whole body shook. He looked up at his father and said through his tears, "Dad, earlier tonight I sat in my room and wrote a letter to you and Mom, explaining why I had taken my life, and I asked you to forgive me. I was going to commit suicide tonight after you were asleep. I just didn't think that you cared at all. The letter is upstairs. I don't think I'll need it after all." His father walked upstairs and found a heartfelt letter full of anguish and pain. Afterward, the teacher decided to do a class project, to see what kind of impact recognition would have on a Community. She gave each student three more blue ribbons, and instructed them to go out and spread this acknowledgment ceremony. Then they were to follow up on the results, see who honored whom, and report to the class in about a week. Topic: Yoga and Buddhism - What is the connection between the two? Join Laura as she chats with Aubrey Hackman about Yoga and Buddhism. We also discuss the Telluride Yoga Festival Aubrey created. It is July 8-11! Challenge: Continue looking at how Spirit or the Universe speaks to you. Stories to tell? Email us! They will be offering herbal body wraps, facials, and scalp massage at the retreat! Just Feel Good Retreat: Register by May 31 and save $50! Next Show (5/24/10): We will continue our discussion on how the Universe/Spirit speaks to us. Join us with your story or to learn how to pay better attention to your messages! Topic: Robin Leigh Vella is a spiritual healer, transformation guide and channel. For the past fifteen years, she has been teaching self-empowerment through spiritual awareness. Robin is the author of "Silent Voices of the Soul." More than an everyday guidebook, "Silent Voices of the Soul" offers a simple and relatable approach to awareness. Written for spiritually-minded people of all ages, it brings metaphysical concepts down to earth and into the real world. Robin is also a spiritual healer, transformation guide and channel. Find out more about her at www.robinleighvella.com or connect on Facebook - look up Robin Leigh Vella or Silent Voices of the Soul. Challenge: What kind of signs or messages do you receive from spirit? Next Show (5/17/10): The Muses talk Yoga. Send us your questions about Yoga!